This follow-up to the national best-seller A Study in Sherlock is a stunning new volume of original stories compiled by award-winning Sherlockians Laurie R. King and Leslie S. Klinger. So proud of the Authors tribute to Doyle! Narrated by acclaimed British actor Edward Petherbridge, The Last Moriarty is set in London, 1895. On a cold November morning, a young American actress visits 221B Baker Street, desperate for Sherlock Holmes to protect her from the threats of a mysterious, menacing man who has recently appeared in her life. 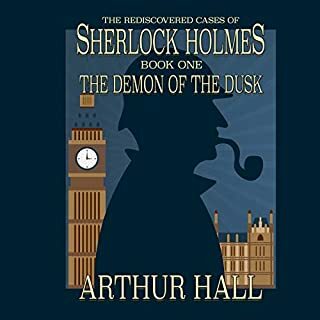 Holmes agrees to help, even though he has just promised the Prime Minister to solve the murder of John D. Rockefeller's security agent before the incident can derail an upcoming British-American summit. "Merridew of Abominable Memory" © 2008 by Monkeybrain, Inc.
"You See But You Do Not Observe", © 1995 by Robert J. Sawyer. ©2010 John Joseph Adams (P)2010 Brilliance Audio, Inc. If you're precious about Doyle's works, I probably wouldn't recommend this. It does tend to lean more towards the speculative than the detective side. Then again it's a little strange in my opinion to be a staunch defender of the Holmesian canon when the author himself said to another writer "You may marry [Holmes], or murder or do what you like with him." I tended to dislike Anne Flosnik narrations but that could be because they pale in comparison to Simon Vance's renditions. His are genius. The quality varies from author to author as you would expect, but there has to be at least one tale here that tickles your fancy. For all the ones I hated there were two I adored. I highly recommend this collection. Overall, I found that the number of stories I really enjoyed far outweighed the ones I just couldn’t endure. As a final thought, most of the “chapter” breaks are between stories, so it is easy to find the beginning of a new story. A mixed bag: with agonising introductions! I have to say, first off, that I found John Joseph Adams' introductions excruciating. Amiable fellow he may be, but I really don't enjoy being told what I'm about to think of something, or how many obscure SF awards a particular writer has received, and convenient chapters allowing the introductions to each piece to be easily skipped would have been a real plus from my perspective. Simon Vance, on the other hand, is a consistently outstanding Watson, and where he is the narrator his efforts really help to lift the material; in some cases this is certainly required, as some stories fall well short of the original mark. The tales are indeed a mixed bag, with many showing Science Fiction and Fantasy leanings, and some even outright Horror. Most manage to capture the 'Sherlockian' tone well enough, but some manage to combine 'dull' with 'faithful'. However, there's more good than bad, and the collection as a whole constitutes agreeable entertainment. While I prefer more straightforward detective narratives with the typical rationalist flavour of the original, I found Neil Gaiman's effort the most appealing, despite its reliance on the whole gamut of SF, Fantasy, and even Horror. I don't know that my namesake would have approved, but I'm sure that Gaiman has placed his two characters exactly where he would have wanted them to be in this nightmarish alternate past. My recommendation? 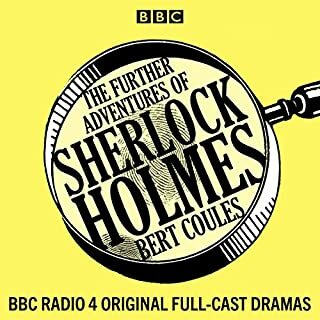 If you're a Holmes fan, and have enjoyed respectful pastiches such as Bert Coules' 'Further Adventures...' radio plays for the BBC, AND you have a credit to spare, I reckon you'll be happy enough! I was skeptical at first, but I was hooked after the american stopped talking and the Brit started reading about Sherlock Holmes and Cthulhu. Such brilliant stories! As a lover of the Sherlock Holmes stories, I really enjoyed the unique approach offered in having Holmes solve these Sci-fi mysteries . The stories are well written and the editor (John Joseph Adams) does a fantastic job of maintaining the continuity of the narrating form used of Watson throughout the book. 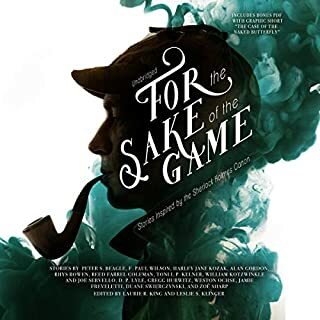 Simon Vance is a great narrator and he does a particularly good job in his portrayal of all the English characters in this book, but especially Holmes and Watson. Very Entertaining in deed,. there are some good stories here, of note are the Tanith Lee, the Burgess, even the Gaiman though I'm not normally a fan of his. And the very last story is a little classic in it's own right. But overall, though the authors may love Sherlock, I felt not many had the tone right nor the overall feel of Sherlock and so many left me disappointed or unimpressed. Take your chance, but I'd be tempted to listen to only the ones I mention, those I would listen to again, the others, not so much. This turned out to be great fun! I bought it with reservations, because some "Sherlock by another author" books and stories are definitely not successes. But this is a great collection, generally respectful to the original but with much imagination thrown in. The narrators are wonderful. Highly recommended when you're looking for something a little different - and something that comes in small, separate doses. Especially good for in the car! Let's face it, certain stories in this series are particularly non-canon. And there are even a few that are almost insulting in their cavalier creative lisence with the characters. However, even those stories I've mentioned above aren't without a certain amusement for someone who can take a little ribbing about being a Holmes fanatic. Just remember that not everyone is as reverant as a devoted fan and shouldn't have to be to enjoy spinning these characters into new stories that give us more chances to see them in action. As long as you're prepared to take this series of shorts as just that, a series of short stories and not an attempt to revamp or in any way challenge the Arthur Conan Doyle versions of our heroes, you'll find it, over all, a very satisfying listen. I couldn't find this story in the TOC or on this "unabridged" recording. Otherwise, I enjoyed the narrator and some of the stories. I bought this with some hesitation as the sample is read, not by the narrators, but by someone who introduces each story and the reader is somewhat dry. However the stories are suberp and on the whole well read. They have provided me with many hours of entertainment and have sometimes been amused and sometimes found it spooky, an excellent mix all round. My advice is if you are a fan of Baker Street don't hesitate, the occasional odd pronounciation won't effect your enjoyment and may introduce you to new authors. I've really enjoyed these stories. It took me a long time to decide whether or not to download this book of stories. I love Sherlock Holmes' amazing and logical powers of deduction and didn't know if I liked the sound of some of the tales in this selection. 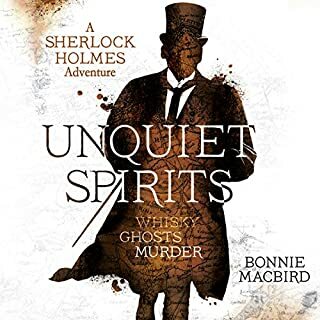 Some of the stories are better than others but they all have the feel of Conan Doyle's Sherlock and Watson and I've really enjoyed this audio download. One downside is the American who explains a little about the author of each story before each story begins. I don't like his voice, especially his pronunciation of "Moriarty".... but this is a small niggle. If you like Arthur Conan Doyle's Sherlock and Watson there's a good chance you'll enjoy this book. Perhaps unsurprisingly,the quality here varies wildly. Some stories evoke Doyle brilliantly, while others demonstrate the poorer instincts of fanfiction: Watson's American nephew will turn up as a Mary Sue for the (US) author or dialogue will be peppered with Americanisms followed by "-as our American cousins would say". Enjoyment depends a bit on familiarity with the Doyle stories. Some authors seem to use crib-sheets of clichés, rather than canon. Thus Irene Adler is the *only* thing able to coax Holmes out of retirement (to America, naturally), and Watson still reels in surprise at basic deductions, despite decades of friendship with Holmes. Comically, a third of the stories make painstaking reference to Holmes filling his pipe from a Persian slipper - a detail only actually mentioned once by Doyle. Yet other stories are wonderful, a superb melding of Doyle's style with the weird. Most fall into the format of "Holmes+": Holmes+Lovecraft, Holmes+Time Travel, etc. The best work both as satisfying detective stories as well as genre tales, and the worst at least maintain your interest for the genre-mashing. A highlight combines Holmes with psychic detective Flaxman Low: they investigate in tandem, providing parallel solutions (one natural, one supernatural) and the listener must make his/her mind up. The only sour note is the continual presence of the Editor, who introduces each story... often badly. "This story involves parallel universes," he says. Well that's the solution to that one then. Simon Vance is on excellent form, with a very traditional Holmes and Watson that grounds the pastiches nicely before they fly off into stranger realms. Flosnik, though able, is less successful. She reads those stories with female narrators (good plan), but then parades through Italian, Scottish, and Somerset accents with little success. At 22 hours and over 30 stories, treat this as a lucky dip. Variable quality, but worth it for the highlights. The stories are improbable, but some of them are also very entertaining and in the style of Conan Doyle. What is difficult to take is the reading of the link man between the first few stories, who seems to have never read Sherlock Holmes and persists in calling Moriaty, Holmes arch enemy ' Morierity' Surely someone doing such a job should at least get the pronunciation of a charector right.!!! On the whole a good listen, if in places a tad too improbable. What did you like best about The Improbable Adventures of Sherlock Holmes? What did you like least? 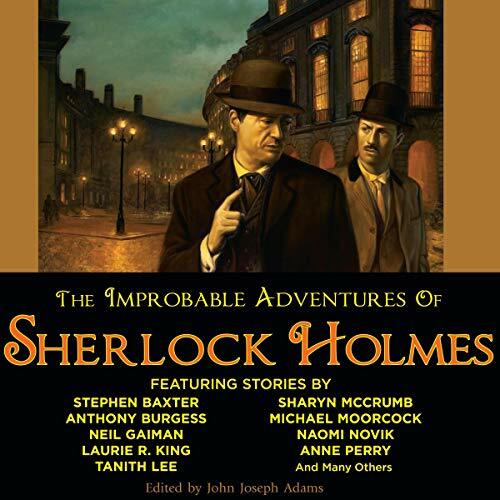 There are some excellent stories in this collection, especially those that occupy the more improbable or impossible reimaginings of Sherlock's world, as suggested by the title. There are unfortunately also many duller offerings, which don't seem to fit the brief at all and leave the listener wondering why they are part of the collection. 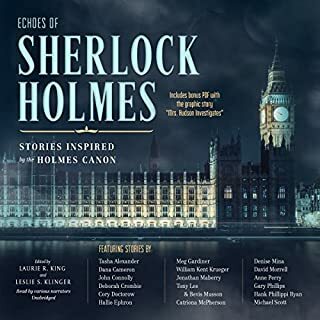 The same can be said for the narration: Simon Vance does a great job of producing voices for both Watson and Holmes which are uncannily like the ones I have in my head when reading Holmes stories. Anne Flosnik, on the other hand, has no business reading audio books, least of all those which require any kind of regional accent. What three words best describe Simon Vance and Anne Flosnik ’s voice? If, like me, you love Sherlock Holmes (and Dr Watson!) but have heard all of the stories, you will love this collection of new ones. The intros to each book are done by an American who cannot say Moriarty (Mor-e-are-it-ee!) but the narrotors of the main stories are excellent. Plus its 22 hours, so it represents great value! What would have made The Improbable Adventures of Sherlock Holmes better? Stories are OK but the commentary in-between is distracting and irritating. Would you be willing to try another one of Simon Vance and Anne Flosnik ’s performances? What character would you cut from The Improbable Adventures of Sherlock Holmes? A different light on Holmes. Great stories and great production. Each one was well told and chapters were not too long. 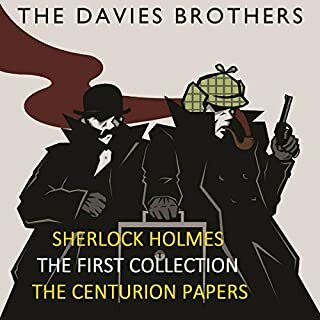 This is a fun collection of alternative detective stories set in the world of Sherlock Holmes. Would recommend it. I would redo Anne Flosnik's narrration with a different narrator. It was a very hard listen as she sounded like a computer narration with odd iinflection and tone. The introductions were annoying especially as he couldn't say "Moriaty". You could tell some of the stories had been written by north Americans as the language used wasn't entirely british and it grated to hear Watson say thinhs he wouldn't have. Would you recommend The Improbable Adventures of Sherlock Holmes to your friends? Why or why not? Yes but only if they were Holmes fans. The narration by Simon Vance was good, Anne Flosnik's was terrible. Could you see The Improbable Adventures of Sherlock Holmes being made into a movie or a TV series? Who would the stars be? Unfortunately the definite Holmes, Jeremy Brett is no longer with us. On the whole most of the stories were good, there are a couple that were very wrong and felt like the author had never read all the originals.